One of my favorite things about living in Quebec City is that the St. Lawrence River is big enough that we see boat traffic more typical of a seaside port. Being a landlubber born in the dry, landlocked inner mountain West, watching big container ships, cruise ships, Candian Navy and Coast Guard ships, and sail boats on the river can entertain me for hours. Even better, several times a year there are big events directly associated with the river and various aspects of Québec's nautical heritage. Last weekend was a prime example - the TRANSAT Québec Saint-Malo started right in front of Vieux-Québec, and it was really something to behold. I spent several afternoons at the port, poking amongst the sail boats, snapping photos and making quick sketches, and gleaned some tidbits about this signature transatlantic sailing race. This year is the 8th running, and in the week preceding the start, curious spectators and race fans flocked to the Québec harbor. Over 200,000 spectators were expected at the events, which strive to bebe “zero-impact,” due to eco-responsible methods and partnerships which include the Canadian Wildlife Federation. You can learn more about the race, and track the boats’ progress live, by visiting www.transatquebecstmalo.com. The race traverses the Atlantic Ocean for a distance of nearly 3,000 nautical miles (over 5,000 km). The first section, 376 nautical miles (696 km) along the St. Lawrence River, poses serious challenges due to currents, reefs and sandbars and varying channels. The winner is the first boat to arrive in Saint-Malo. All other boats must arrive within the following 10 days to qualify as having completed the race. The race is an “open” format, allowing several classes of sailing yachts to compete, including multihulls (MULTI50 and others between 40-60 feet in length) and monohulls (IMOCA, ECO60, CLASS40, and others between 45-70 feet in length). In addition to specified sail configurations, each boat must have a propulsion engine in order to enter, exit and move around in port independently. The minimum crew size is three, and all crew must be at least 18 years of age by the start date of the race. Clear safety regulations stipulate medical emergency training and certifications, and specific experience at sea prior to serving on a TRANSAT crew. During the week, crews cheerfully discussed their menus and other considerations with onlookers, all the while steadily continuing with their preparations. Registration fees range between $7,500-$8,500 per boat, depending on the boat class. 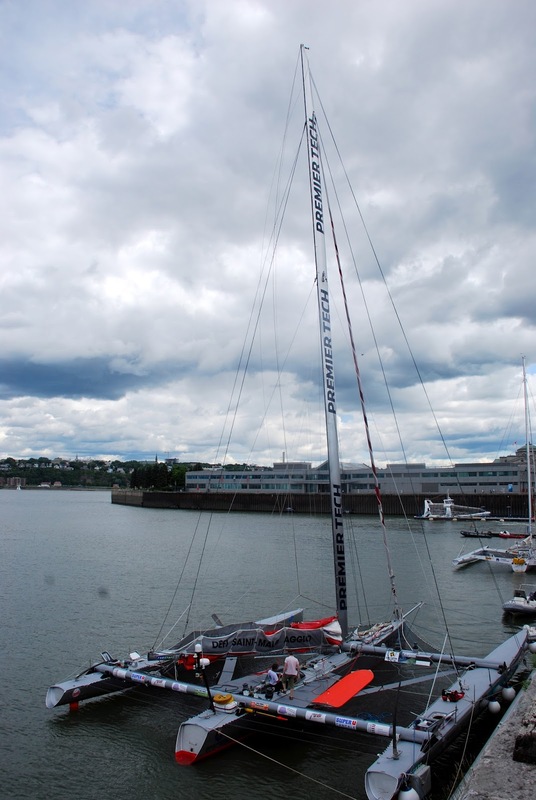 In addition, teams must factor in the cost of the boat and all equipment, supplies, transportation of the boats and crew to the starting point in Quebec City from their home ports, and wages if crew members are being paid to participate. With a total purse of $100,000, split amongst the winning boats, winning might make it all worthwhile. Competing boats come from all around the Atlantic Ocean. There are four from Canada (including a local boat from Lévis), two each from Belgium and Germany, one apiece from Italy and the USA, , but the majority are from France (16 in total). The race began Sunday, July 22, and the départ is a sight to see. The 25 sailboats cruise the St. Lawrence as it runs past the city, accompanied by nearly every boat that floats in the local harbors. You can see the whole regatta for quite awhile, until it slips out of view as the river curves around l'Île d'Orleans.